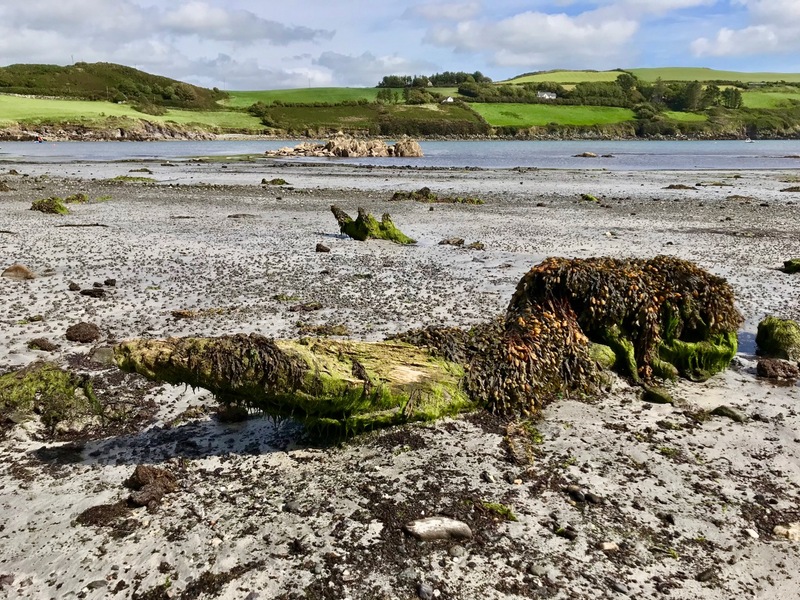 In West Cork it is possible to examine the remains of trees which were growing several thousand years ago – perhaps in the time of our earliest ancestors. Around the coasts of Ireland and Britain are sites of post-glacial forests which flourished close to an ancient shoreline until inundated by rising sea levels in the Neolithic period. Cycles of change in weather, tides and geology over millennia saw these remains flooded by encroaching seas, then resurfacing, only to be buried under sediment and sand as tides abated. 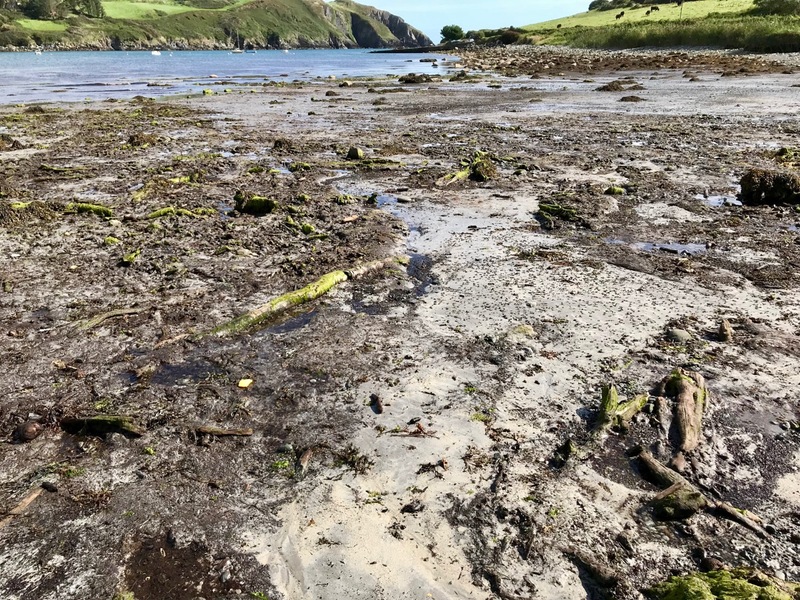 We are living in an age of extremes and recent abnormal climate activity has in places exposed some of these remains which are as old as human activity in Ireland: this is Organic Archaeology!
. . . In 5,000 BC, the sea level rose rapidly and swallowed the earth. The sand dunes were pushed inland, burying the forest, and then the sea receded somewhat. Now, the sea level increases again: it cuts out the sand dunes and exposes the forest . . . During the course of the investigation, the archaeologists found evidence of human presence in the area: traces of adults and children , the analysis of which revealed that they were wearing leather footwear. With human footprints the scientists also found footprints of wild boar and brown bears . 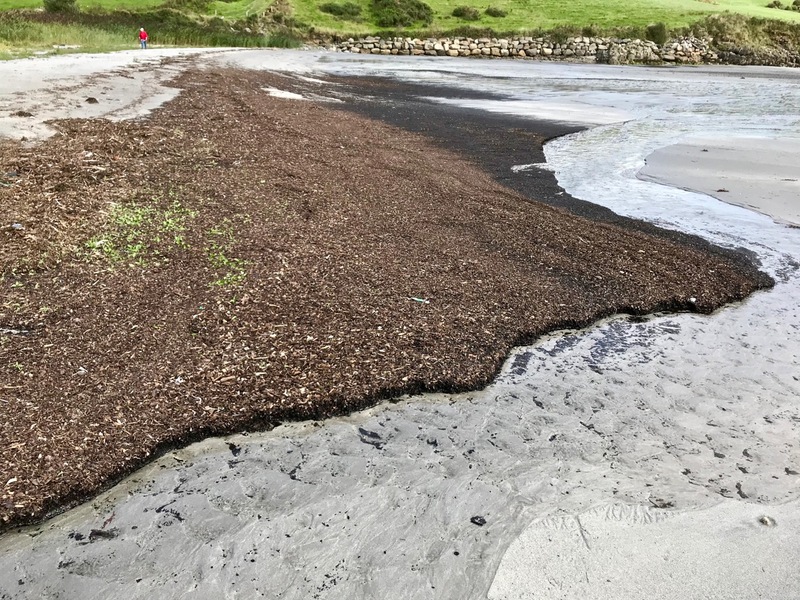 . .
Part of the beach at Tralong Bay, Co Cork: the surface of the peat mass, which could be up to 4 metres thick, is interspersed with numerous tree boles, roots and scattered branch and twig debris. 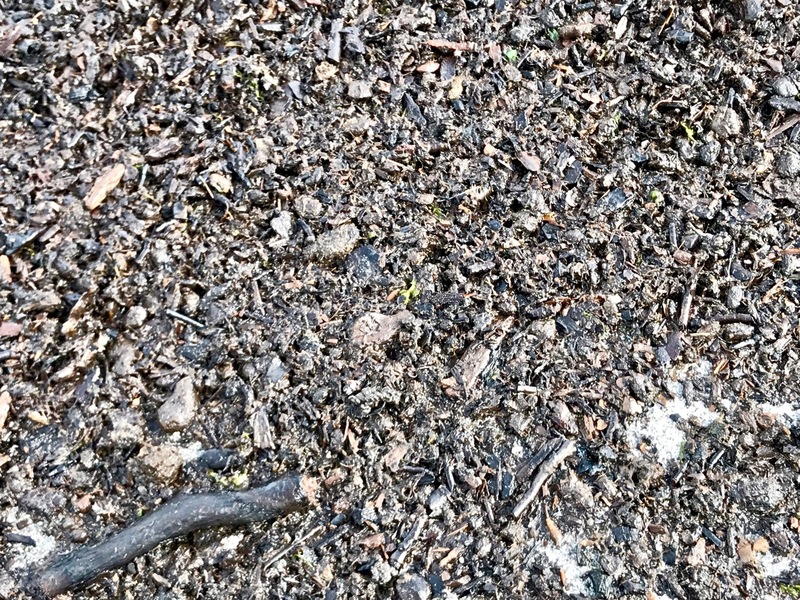 At one place I found a perfect complete pine cone, which could have been part of that debris. 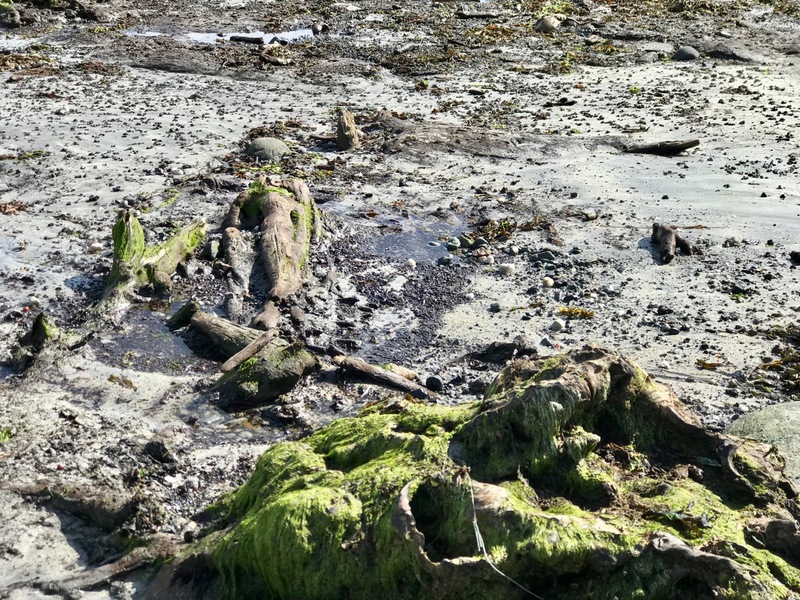 The surface of the beach is dotted with these remnants of ancient forest, over a wide area. It seems remarkable that there are also extensive blankets of loose material retained in the bay which must also originate from the forest. 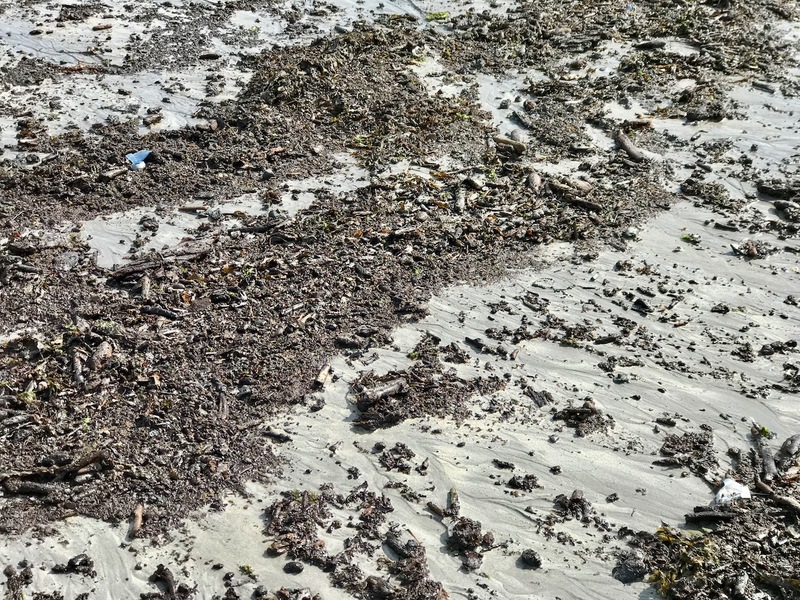 Upper picture – one of the huge blankets of organic material – mainly wood based – which has been washed up to the north end of the bay at Tralong since the extreme storms of 2014. 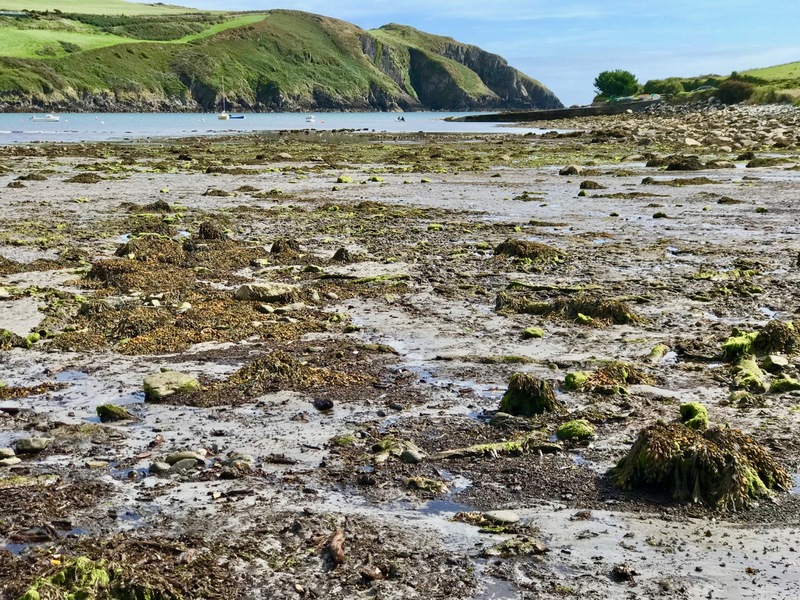 Lower pictures – closer views of the debris showing recognisable material including twigs and branches.
. . . All summer the quiet tides returned the sand that last winter’s storms had dragged offshore, heaping it even deeper over the old oaken wreck on the strand . . . Perhaps, though I hope not, this winter’s great mill wheels of waves will grind that deeply again. 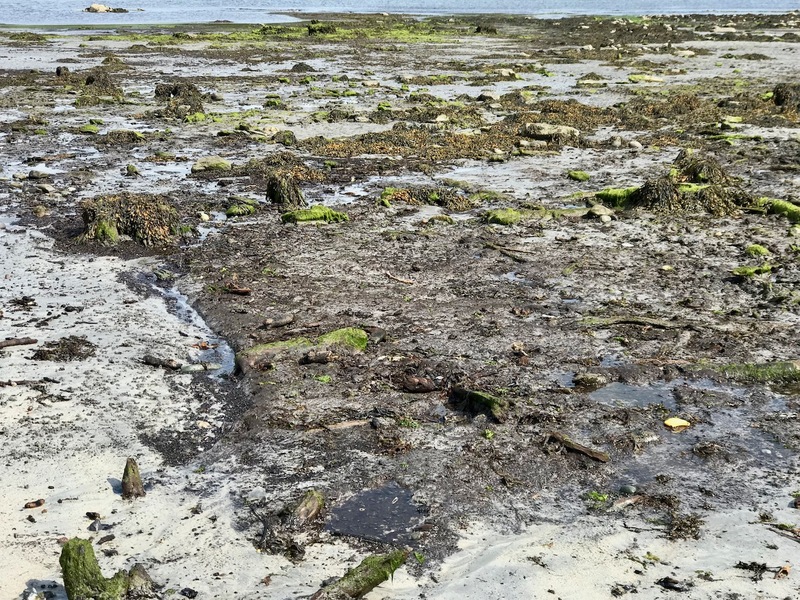 Storms two years ago tore away whole layers of sand and stone west of Spiddal in Galway Bay, uncovering stumps of ancient oak, pine and birch from a 7,000-year-old forest drowned as the sea rose after the end of the Ice Age. The same exceptional seas, on the north coast of Connemara, exposed remnants of human occupation a metre thick in the sand-cliff shore of Omey Island. There were medieval burials among them, and bog at least 6,000 years old . . . Elsewhere along the west coast yet more of the kitchen shell middens of early settlers, back to the late Mesolithic, were stripped away. So the sea reveals the past and then takes it away . . . Glimpses of Ireland’s lost shores and drowned forests are not new. 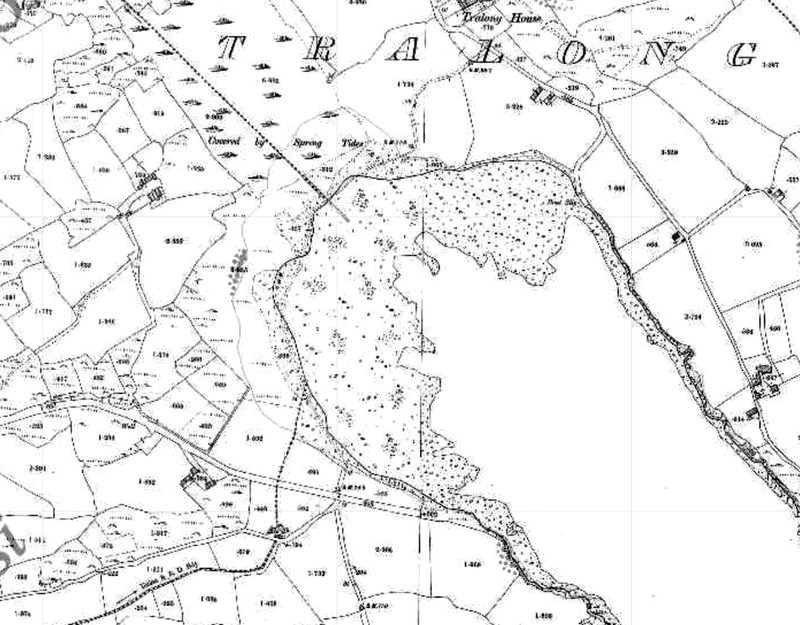 Pinewoods submerged off the Bray coast were described by Robert Lloyd Praeger at the end of the 19th century when construction of Bray harbour changed sediment flows and piles of collapsed trees appeared above the sand . . . Ancient forests reappeared again in Bray, Co Wicklow, in 2001, and more were revealed recently – in 2017. 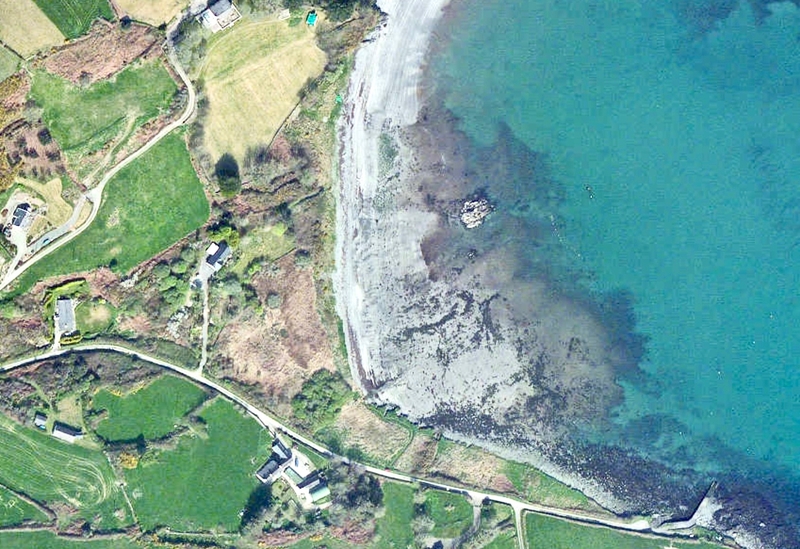 The Irish Times reported earlier this year on a project to discover “the lost landscapes” of the Irish Sea. Tralong Beach will change again, as the weather patterns vary, and it may not always be possible to experience the drowned landscape here. It’s an unmissable journey into deep history. This entry was posted in Archaeology, Bog, Cork, Irish History, Irish Landscape, Nature, Tralong, West Cork Blog and tagged Climate Events, Clive Waddington, Drowned Forest, Drowned Landscape, Early Human Occupation in Ireland, Michael Viney, Northumberland UK, Organic Archaeology, Peat Mass, Rising Sea Levels, Tralong Bay, Tralong Beach. Bookmark the permalink. Thank you for this very interesting article. I have also seen the drowned, petrified forest exposed at low tide in the general Cleggan area with Michael Gibbons. The subject is fascinating. 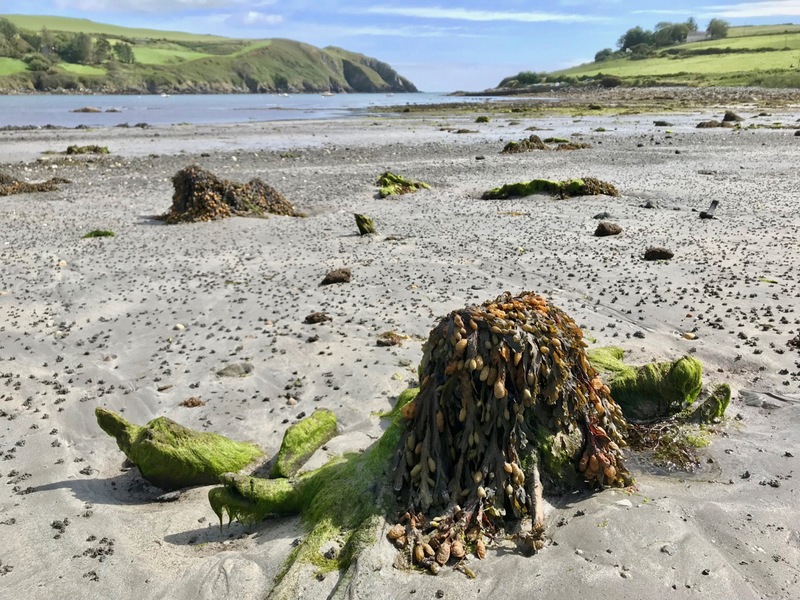 There is a drowned forest in Mount’s Bay, Cornwall, and i saw the petrified tree stumps when I lived there. The story told was that Mount’s Bay had been a forest is recently as the time of the Roman invasion – and it was also said that, at that time, the isles of Scilly was all one island. I don’t think it was actually as recent as that – although I don’t know for sure. Thank you, Noreen, Do you remember seeing the ancient trees then? I believe they have only really become exposed with the churning up of the shoreline in the extreme storms of the last few years. Never been there but find it immensely interesting and because you documented it so well, gives a very good oversight. Well worth a visit! Tides and weather conditions will change the beach over time. Isn’t it astonishing that so much remains considering the age, amazing to think that loose material may originate from the forest. It’s a wonderful secret area too isn’t it? It’s a very peaceful place, deserted when we were there. And of course there is a well nearby !